Lots of listener questions, plus emails we have received about learning to speak the native language of Ireland. Eoin also addresses a forum thread about whether or not he’s an native speaker of Irish. What’s your opinion? Read on, and leave your comment at the end of this page. How different are the dialects of the Irish language? Where should you visit on your first time to Ireland? Nuair a bhí mise ag fás aníos bhíodh eagla orainn Gaeilge a labhairt mar bhíodh daoine ann i gcónaí ag caitheamh anuas ar an gcaighdeán nó ar an bhfógraíocht a bhíodh againn. Mar sin, níor labhraíomar í. When I was growing up, we were afraid to speak Irish as there always seemed to be somebody around to criticise the standard/pronunciation etc. So we just did not speak it. Chuaigh mé go dtí go leor ranganna Gaeilge le roinnt blianta anuas, agus thug mé faoi deara go mbíonn an eagla seo ar na mic léinn fós cé go bhfuil siad lán fásta anois. Táim feargach anois gur lig do dhaoine eile bac a chur orm í a labhairt. Having gone to several Irish classes over the last number of years, this fear still remains with the adult students. Only recently, I have got over it and am really annoyed that I allowed others to stop me enjoying the language for so long. Criticising the Irish of another person, especially criticising a native of Dublin, Ireland, brought up with the language in his native city, beggars belief. Keep up the good work, Eoin. Máire, are a native speaker of Irish, or did you learn it in school in the non-Gaelscoil schools? No one is criticising a learner’s Irish – you have definitely misunderstood the discussion on that point – just pointing out that there is a difference between good native Irish and good attempt to revive Irish by people who don’t have the full knowledge of the language required to revive it properly. Imagine if someone in Egypt, a learner with flaws in his English, decided to speak exclusively in bad English to his son – that son would grow up speaking that form of English “natively”, but it would not be proper English. The comment is not on the “native” aspect of it – because if someone has spoken a language, even a poor facsimile of it, all his life, then he “natively” speaks that – but rather on the quality of the thing he has been brought up to talk natively. You could bring your children up to speak ecclesiastical Latin – you know how the church has an Italian-style pronunciation of Latin, eg chaylum for caelum etc, which would not have been understood by Julius Caesar – but there would be a clear distinction between such “native” revived Latin and the real thing. I don’t blame Eóin at all – I blame the government for setting up an artificial standard. thanks for the kind comments, and I see your intelligent argument for sure. Go raibh maith agat a Mháire. Aontaím leat go huile is go hiomlán nár chóir go ligfeadh meon dhaoine eile stop a chuir leat ag labhairt as Gaeilge. Thanks Máire. I agree with you completely that others attitude shouldn’t stop you speaking in Irish. Tuigim go maith gur le Gaelainn do tógadh Eóin, agus mar sin labhrann sé as an gcliabháin í. Nuair adeirthar nách cainnteóir dúchais Eóin, ní bítar á dhéanamh amach nách í a “chéad teanga” í – b’fhéidir gurb í a “phríomhtheanga” féin í, an teanga a labhrann sé an chuid is mo dá aimsir, agus, b’fhéidir, teanga ‘na mothaíonn sé é féin rod beag níos nádúrtha léi agus é á labhairt. Mar sin, níl aon bhaint ag an míniú (GRMA as, dar ndó’) anso lena bhfuil ráite agam agus ag daoinibh eile go bhfuil suím acu in sna canúintíbh fé leith. Má táthar ag tógáilt duine i Moscow leis an mBéarla, agus nách cainnteóirí dúchais iad a mhuíntir, agus nách dea-chainnteóirí féin iad, an bhfágann san gur cainnteóir dúchais é féin? B’fhéidir go mbíonn sé á labhairt i gcónaí riamh, ach seans maith go bhfuil ana-dheifríocht idir a Bhéarla san agus an Béarla mar a labharthar i Sasana agus in sna tíorthaibh eile go bhfachtar an Béarla iontu é. Is féidir do chlann do thógáilt le droch-Bhéarla agus tu id chónaí i Moscow féin agus gan aon tsaineólas ar an dteangain agat! An dtuigeann sibh me? Admhaím, agus is gan aon ríghneas é, go bhfuil ana-bhárr ag Eóin i dtaobh na Gaelainne ar na daoine nár tógadh le Gaelainn – agus go mór mór ana-bhárr aige seochas na glantosnaitheóirí agus na foghlamóirí eile. Ach pé olc maith é an rod lenár tógadh é, ní Gaelainn dúchasach é, agus ba chóir go n-úsáidfeadh Eóin an Ghaelainn lenár tógadh é mar chlochán cora, rud a thugann neart do an Ghaelainn dúchasach do staidéar agus leogaint di dul féna chuid Gaelainne agus í ‘ tharrac níos goire don Ghaelainn cheart. Tuigim an méid is atá á rá agat, agus go raibh maith agat as do smaointe a roinnt anseo. Daoine agus idir dhroch-Bhéarla agus droch-Ghaelainn acu, daoine gan Bhéarla gan Ghaelainn. Chímíd inìs gur tharraig Béarla Shasana agus Mheirice chuige an teanga mar a labharthar in Éirinn í, agus ní déarfí a thuilleadh go bhfuil rian “droch-Bhéarla” ar a’ Hiberno-Irish, agus níorbh fhearra rud a dh’imreódh ar Ghaelainn na nGaelscoileanna agus ar an Urban Irish ná an rod céanna ‘ dh’imirt uirthi fé anáil na Gaeltachta. Dáltha an scéil, nílim 100% i gcoinnibh na hoibre atá idir lámhaibh agat a Eóin. Ní tugtar ach “bite sized Irish” – greim beog na teangan – anso – na frásaí is bunúsaí agus rodaí eile mar sin, agus b’fhéidir go mbeadh a dhóthain slí sa mhargadh chuige i measc na ndaoine ná taithnid na téacsleabhair mhionchruinne leó agus gur mhaith leó nithe beoga ‘ phiocadh suas anso. I utterly agree with David’s post and I thought the analogy that he made illustrated his point very well. My previous post was not meant to be any sort of commentary on where you were born or which dialect of Irish you were raised with, Eoin. I think it’s good that you are reaching out to people who do not have access to instructors – in fact, I’m in that very same position myself. I just think it would be great if you were teach the language as it is spoken by actual communities of native Irish speakers rather than teaching “standard”. Thanks for the feedback for sure. Ideally, I would love to have multiple speakers from each of the main dialects, with slow recordings, conversation, videos, and live sessions available with them. Getting there is a question of resources (especially time for me, but also money). “Progress, not perfection” is a term I like to use in my personal life to get to towards objectives! You seem to have hit a nerve with this, Eion! Bravo! From the outside it is easy to say “Why don’t you hire…?” As an online content providet and business owner, I only wish I had the funds to do half of what I dream of doing! That said, thanks for the mention in both this episode and the last. And tell Elizabeth to drop me a note… I’d be happy to help her plan a magical Ireland Vacation! I agree. This is a game of resources rather than anything else. We’re out to help people connect more deeply with their Irish heritage by learning to speak Irish. Apart from time and money, the sky is the limit! I’m not sure how someone born speaking a language wouldn’t be a native speaker. I learned English at home and also at school, I think learning both ways is a necessity. I really don’t follow the logic of a foreigner declaring what is “native” Irish? It would carry more credibility if he, himself, was from a Gaeltacht area. Lastly, I’ve never heard Eoin state that Bitesize Irish Gaelic was the end-all-be-all for the Irish language. It’s a place for people to get a start. If you’re an expert in the language, you’re going to be able to find issues. That can be said for any subject, ever. If you are an expert—I would say offer your help, instead of your criticism. That is if you really feel that strongly about it. Thanks for your comment Dennis. Yup, we need to focus on the feedback rather than dwell on criticism. Bitesize Irish Gaelic is being used by hundreds of learners to be able to begin their journey of a lifetime, and we’re only going to improve how we help them, year on year. Does http://www.ranganna.com grade/score based on dialect? I see they also offer classes but there is no mention of dialect. Which begs the question, why put so much emphasis on the importance of Ranganna scores, if Ranganna doesn’t scrore based on dialect. Since dialect is the subject at hand. Maybe dialect is separated out once you apply to be tested? I have to say, after reading that forum in ridiculous detail. It makes perfect sense why some people don’t even start. Thank you so much for providing a fantastic written & audio resource for starting to learn Irish! Go raibh maith agat Jordy! agree with your interpretation of a native speaker. if can be arranged. The web format you have certainly can handle it. American English as had previously been the Queen’s English. After listening to your lessons why he said it that way. I once went to Montreal with a “native” French speaker from Champagne region. asked him why. He said, the locals spoke like he remembered his Grandmother speaking. What’s so funny I asked and could he explain it in English? thanks for your feedback, and I think Bitesize Irish Gaelic could be more valuable to have Gaeltacht speakers in the recordings. It does come down to my restraints (in time especially). But that can’t be an excuse for moving us forward! Thanks for sharing the perspective of Montreal French, from the perspective of your friend. Just heard the podcast last night and was left speechless that Eoin’s language is an “issue”, “controversial” or even a topic of discussion! Eoin provides an invaluable service to those, like me, who are trying to learn the language far from Ireland. He has expanded his program over the last few years to accommodate the wishes and learning styles of his subscribers. I was one of the people who basically begged him to add audio lessons. I had a set of cd’s that I loved to listen to in the car and after memorizing them realized there were no others available. I am so thankful for finding Bitesize on line. I could click on the microphone and hear words being pronounced which was a far cry from struggling to decipher written Irish with absolutely no guidance or instruction. I do not do well sitting at a computer for long periods of time, so the audio lessons are wonderful! I can clean stalls, paint barns, weed, garden, and walk my dogs while learning Irish. More than the language, Eoin conveys a love for his country, his culture, his family. 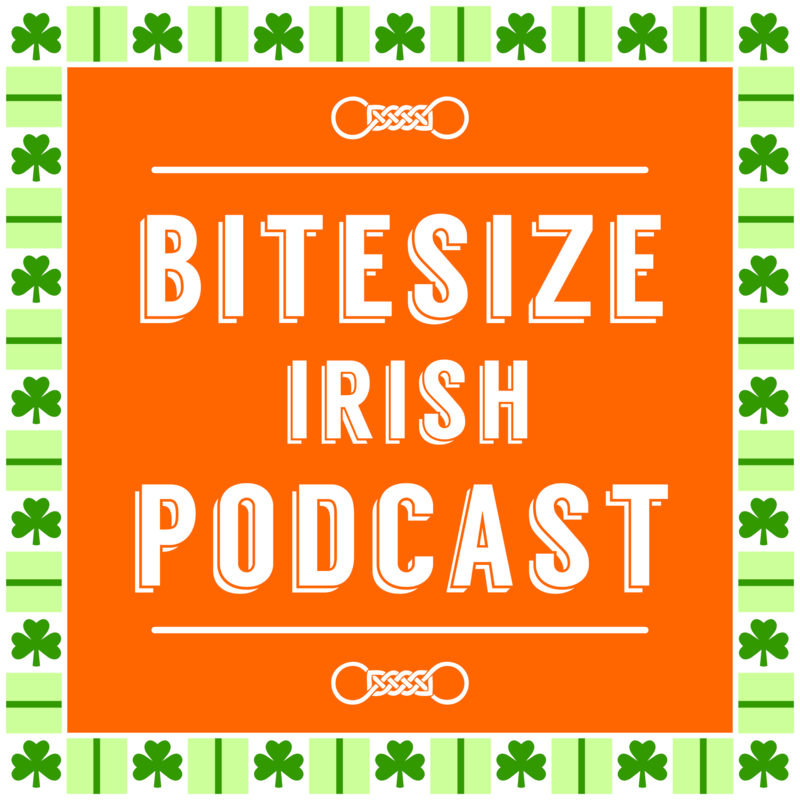 I joined Bitesize for the Irish, I stay for the insight, the humor and the fun of learning and connecting. I feel like Eoin is a major part of my personal search for my own Irish roots, just by doing what he does. I was born in northern NY and have lived in NC for 30 years, in a military town. There are people here from all over the country. There is no one correct way to speak English here, or anywhere! The dialects, the accents are all part of life. (Don’t ever tell a US Marine he may not be American enough!) I have also been a math teacher for 22 years. Hundreds of students have learned from me. Since I don’t teach Spherical Geometry, would it have been better for my students if I had never taught them basic Algebra? Ah, that means a lot Laurie! Go raibh míle maith agat. Thanks for the support, and for being part of the Bitesize Irish Gaelic clan. You’re doing a bang up job, and I’m grateful for all your hard work. Thanks for the kind words, a chara. Brenda, any chance you’ll be at Milwaukee Irish Fest? My flights are booked. Jody, I’ll be flying into O’Hare and getting transport to Milwaukee. The point is Eoin cares for Ireland and the Irish language. He does his best promoting and teaching Irish Gaelic on line at Bitesizeirishgaelic.com. 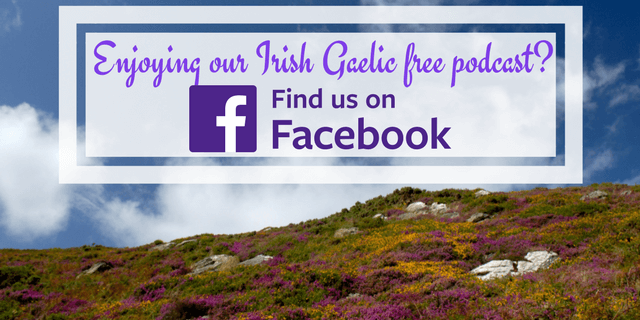 It’s to help people in many foreign lands to connect to their Irish roots and heritage. To share his passion for Ireland and the ancient language of Ireland. “Tá Gaeilge agus Béarla líofa ag Eoin cosúil leis na Gaeltachtaí.” Níl aon dabht faoi sin.” He claims to be a native speaker of Irish, and why not?. He was brought with Irish and lived a stone’s throw from the Gaeltacht. The Irish Gaelic taught on the Bitesize website seems to be “an Caighdeán Oifigiúil”. The Irish spoken on TG4 the Irish TV. Channel sounds to me like standard Irish. It’s a small but very important point about other native speakers coming to join Eoin on Bitesizeirishgaelic.com. Ar aghaidh linn.! Pádraig. I accept there is feedback from a number of people how we could improve things. It shows that he held at least some negative feelings toward me personally, and to bring that into the discussion of teaching Irish worldwide shows that he has not separated his feeling towards me, and then what he thinks about Bitesize Irish Gaelic. I think it’s important to understand that context when reading his posts. those are some great ideas for visiting – taking in the real ancient sights of Ireland. Yes, the name Seán is also connected. From what I understand (I’m not a history person), it comes from the French name Jean. So it’s an Irish person’s pronunciation of the French “Jean”, essentially. I’m told it came to Ireland with the French-speaking Normans who settled in Ireland. And Jean is the French Biblical version of John. They are all connected, as far as I understand. First, I agree that a “native speaker” is someone who learned a language as his or her first language (or one of his or first languages, if multilingual). That is not really the issue here, seems to me. 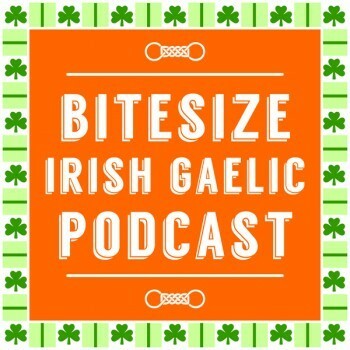 Second, as mentioned in the podcast, the slowed down version of words on Bitesize Irish Gaelic is so valuable for those of us learning in isolation! Whatever the dialect one ultimately gets into, and I accept that there are definitely differences and probably you have to choose at some point, there are still very broad rules for pronunciation and interpreting the written Irish that can be learned much easier from the slower recorded versions Eoin has made. I found that these recordings were the thing that helped me finally get how the vowels work, and that, alone, is worth so much! I was held up for years by not really getting this, once it finally clicked so I could actually start trying to write things down and sound out words I have been making rapid progress. GRMMA a Eoin! Third, there are quite a handful of sounds in Irish that just don’t exist in English, and hearing things pronounced slowly helps me to pick them out and try to figure out how to make them come out of my mouth. At normal speed it”s quite hard to even hear them properly. Again, as you move into more specific dialects I’m sure this is even more the case, but for beginners it’s still a matter of just trying to approximate and get close to these new sounds. That’s how learning a language works. It’s all about gradually refining your first attempts into correct forms. You don’t just wake up speaking perfect anything one bright morning! Finally, Bitesize Irish Gaelic is not meant as a comprehensive course in the Irish language. It’s a great resource, it’s a good reference to use with other materials, you can learn some casual phrases and then develop the hunger for more Irish any way you please. The most important thing is that Eoin’s materials help to make this beautiful language, which can be quite baffling at first, accessible to anyone, and the learning of it seem less daunting. Fair play to you, Eoin! Well go raibh míle maith agat, a Isa. I will point out that the lessons are not written by me, so I can’t take credit there. It’s great to hear your perspective, and that you’ve gotten value from our slow+fast recordings in conversational lessons. I really enjoyed your pod cast. It was very informative. Nice to hear it Gordon. Thanks for taking the time to drop by. nap, if they won’t all stay in one place? That does present a problem! Thank you for the giggle! During the middle two weeks of July 2013, I visited Ireland, at the Citywest Hotel in Dublin (Bla Cliath?). After checking in at the front desk, I walked to the Welcome Desk across the lobby. As her husband was busy with the recalcitrant computer, I introduced myself in Irish to his wife. She responded “Just a second” while completing a form. Looking up, she was surprised to see an American saying this. After a brief chat, she said I should see her 15-year-old son, right over there, as he has been studying Irish since he was three. I did the same with him, saying the greeting slowly and as clearly as I knew how, and we talked for a minute till I ran out of Irish words. He was impressed I had gone so far in only a couple months. Remember, this was when Eoin had just released the seven-part trial program. I’d had about ten weeks or so of listening and practice, to and from work, every day. He then asked who the instructor was and where he lived. Now, listen up! This told me many things. First, Eoin is from Limerick or has lived there long enough to pick up a local accent sound, much as I can tell if someone claiming to be from Texas really is or not. Secondly, this accent, if you will, is transmitted over the MP3 system I’m using, clearly enough for me to pick it up unconsciously and repeat it. And, please, pardon my boardinghouse brag, but I’m learning Irish well enough from Eoin’s program that I can unintentionally let my listener know where my Irish is from, to the point this 15 year old lad can detect it without trying. Don’t let them get you down, Eoin. Let me correct the date. It was during the Convention in 2012 in Dublin at Citywest. Eóin, the reason why people question your status as a native speaker is the learner’s quality of some of your pronunciations. Tabhair dom an im: first of all a native speaker might be expected to know that “im” is masculine, so it is “an t-im”. Secondly, im has a slender m, but it sounds broad in that file. Thirdly, if it’s Munster Irish you said you lean to, the i is long. It is pronounced “an t-ím”. The nominative is ím, with a long vowel. The genitive is ime, with an short vowel. And then a basic word like tabhair should be pronounced correctly. It is not “tower”. It is pronounced túir. I think this reflects cross-influence from the older future of tugaim, “tiubraidh”, which is why tabharfaidh is pronounced túrhig, and tabhair, tabhairt and tabhartha were influenced by that. Notice the difference between tabhartha (túrha), “given”, and tabhartha (tower-ha),”illegitimate” in “mac tabhartha”. Tower dom – doesn’t mean anything in Irish. Also tabhair dom, as well as being túir dom, can be pronounced trom. Trom an t-ím, led thoil! By the way David, my name is Eoin, not Eóin. The slender “m” in “im” is indeed the quality of my pronunciations – I’ll fix that in the next batch of recordings. Thanks for the feedback. Regarding “an t-im”, that needs to be fixed by our full review of our lessons by a linguistic expert. I did not write the lesson, so it’s not a question of my grammatical ability. I’m responsible for getting the experts to get it right. For “Tabhair dom an (t-)im”, I pronounce it “Túir dom an tím”, so I should stick to that. In your expert opinion, David, is “im” pronounced “ím” in Munster only? Well, I’m not an expert, but I know ‘an t-ím’ has a long vowel in Munster Irish, and according to Micheál Ó Siadhail’s Learning Irish, it has a long vowel in Cois Fharraige too. But the books I have on Tourkameady and Erris Irish, both from Co. Mayo, show it has a short vowel in Mayo. I don’t know about Donegal, but presumably Mayo and Donegal go together to some extent? And the vowel in Eóin is long – and so better written with a síneadh fada. Thanks, David for the explanation. A Phádraig, thanks for the positive feedback. For “Tabhair”, we need to pronounce is as “túir” in the lessons, and so it will be corrected. Glad to hear that you’re hearing the difference with ainm and anam. They’re similar words, but with distinctive sounds (that broad and slender “m” that David referred to). Sounds like you’re making very good progress, well done. It was nice to meet you while you were in Kansas City. We hope you enjoyed your first trip here and that you will return! I take the point about church Latin, but that is not a fair comparison with Eoin’s background. To say Eoin is not a native speaker because he grew up speaking Irish as his first and home language in Ireland but not in the Gaelteacht and because he was additionally taught Irish at school – well, it’s like saying I’m not a native English speaker because I didn’t grow up speaking a well-known dialect in Surrey and I had English lessons at school. Is anyone really going to dare to tell me my English is to be equated with pig Latin in that case? Not really a reasonable line of thought in my view. Eoin-without-the-fada is a native speaker.